I previously had a treadmill, but it took up way too much space and my space was limited so when we moved I left it behind. 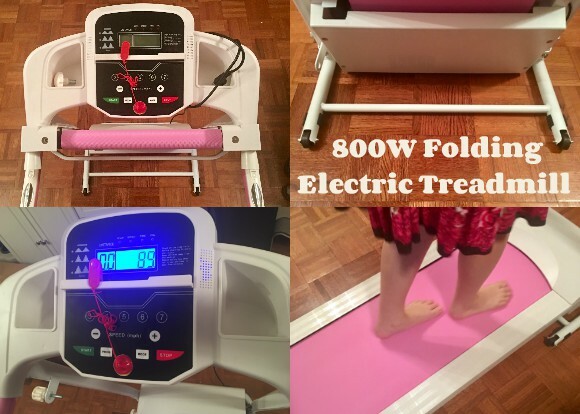 When I saw this folding treadmill I was pretty excited because it's so much more compact than my previous one. I like that it has so many functions built into such a compact unit. When the part you walk on is folded upright the entire unit barely takes up any space. It has a set of wheels at the front even so you can easily move it around which is super convenient if you want to move it to a closet, or from room to room. When down you don't need much room either, just enough for being able to comfortably walk, jog, or run in place. The handles are at a comfortable height and if you hold onto them while using the treadmill they will take your pulse and display it on the digital screen. If you let go of them then you will see other things like calories burned, distance, speed, and time. It even includes two places where you can keep a water bottle, music player, or other items you may want handy. The treadmill comes with your typical safety strap. One end sticks magnetically to the unit display area and the other end you clip to your clothing. IF you were to happen to fall then it would pull off the unit and signal it to stop running for your protection. This is a great feature because you never know when an accident can happen. As you can see the unit displays Err on the screen when the magnetic end is removed - indicating there is a problem and it will not function. Without that part attached it will not even turn on. This is also a great way to keep younger kids from turning it on. Just keep that part stored away from their reach. On the overall I really like this treadmill a lot. It's so easy to use and I can even program it for my personal workout routine.